Do you REALLY understand the nitrogen cycle? A whopping 78% of our atmosphere consists of nitrogen (N2). N2 is an instrumental element within plants, acting as a key component in amino acids, proteins, nucleic acids (DNA & RNA) and other biochemicals. Yet, while plant life is surrounded by N2 found in the atmosphere, most plants (including turfgrass) are unable to turn N2 gas into plant usable forms: nitrate (NO3-) and ammonium (NH4+). Therefore, the plant relies upon microorganisms that manage the nitrogen cycle to naturally turn N2 into the plant usable forms NH4+ and NO3-. N2 in the atmosphere is converted to NH4+ in the soil by the process of nitrogen fixation. This process requires a lot of energy and is performed by nitrogen fixing bacteria living freely in the soil and symbiotic nitrogen fixing bacteria living in certain plant roots. 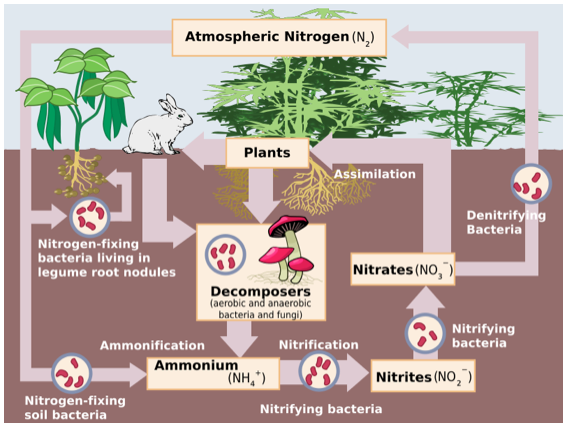 These two types of nitrogen fixing bacteria turn the nitrogen gas (N2) into ammonium (NH4+) a plant available form, through the process of ammonification. If not taken up by roots, specific bacteria (Nitrosomonas spp., consume plant available (NH4+) and convert it to nitrite (NO2-), which is not a plant available form. This is the first step of nitrification. 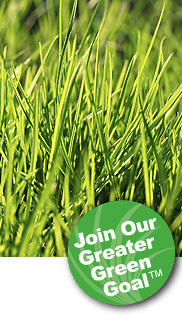 The second and final step is performed by Nitrobacter spp. These bacteria will finish off nitrification by converting NO2- to NO3- which is again a plant available form. When the NO3- is not consumed by the plant or does not leach (wash out of the soil with water), it goes through a denitrification process performed by bacteria. These bacteria first turn NO3- into nitric oxide (NO) then to nitrous oxide (N2O). It is then returned to the atmosphere as N2, a gas. If the plant does consume the N2, an entirely different process follows. The plant first has to die and fall to the soil. When it does, decomposing bacteria and fungi-like mushrooms will begin to consume the plant. This is what naturally happens to all life, including animals and humans as well when they die. The nitrogen will then go through the process of mineralization, which will convert it back to ammonium.